La Cave features an Underground Lounge after 10:00pm six nights a week. Enjoy a variety of free entertainment options, from Sinatra night on Mondays, College Wednesdays, Karaoke Thursdays and dancing and DJs on Friday and Saturday night! Delicious, juicy grilled steaks, Australian Cold Water Lobster, Giant Crab Legs dipped in butter, Fresh Halibut and Swordfish await you at this hip 1960’s retro underground steakhouse. Voted a top 10 privately owned steakhouse in Southern California by Channel 9 “On The Town”! Very pleasant experience. Food and service excellent. La Cave is always a pleasure to visit and the service is always top notch. It is the first restaurant where I’ve ever seen someone tip the cook on the way out also! We always enjoy our nights at La Cave. The food is always delicious and the service outstanding. The "Rat Pack" atmosphere is so different and fun. It adds an extra special element. I am the third generation in my family to share this special place. An old school vibe combined with a neighborhood place type of friendliness, entertainment was great and food was a great value and well prepared. Great ambiance, service and food. The best martini in the O C.
This was a birthday celebration at a place near and dear to my heart. Everything was as expected. This is our go to restaurant whenever we are in town. We have been many times before - however we have never been seated in the "back dining room" so I would suggest to the hostess next time - or better yet - when I reserve a table on OpenTable that we get a spot in the front dining room. Food was great as always. However, we didn't get anyone to greet us at our table for about 10-15mins after we sat down. That was very unusual for LaCave! In the whole scope of things a minor point, but we had NEW customers to LaCave (close friends of ours) that we invite that night and they certainly noted that lapse. As always, excellent in every way. Best restaurant, ambiance and value one can find in OC. How embarrassing! We took friends to this dingy place with tacky green garland decor left over from Saint Patrick’s Day and bad food. The filet medallions were stringy and mushy plus covered with a strange mushroom sauce that had little taste. None of their fish was fresh & Santa Monica Seafood is right down the street with a wonderful assortment. The twice baked potatoes were more like four times baked as they were dry & tasteless! The women’s tiny bathroom could use a serious cleaning. The slats in the stall doors are actually dripping with filth. The venue and food needs a serious overhaul! I doubt a food or hygiene inspector has been in there for many years! we had requested a booth over a week in advance and when they seated us we were stuck between other people on each side of us. not a good table at all. The swordfish my wife ordered was over cooked and also seemed like it was not fresh but frozen. Also the price of our entrees was much more than what other similar restaurants charge. La Cave is quite a find. Located in an unassuming corner of Costa Mesa this place was just what the doctor ordered. We dropped in for dinner before heading to the theater. Head downstairs into "The Cave" and you are transported back in time to a classic old school steak house. They did not bring us menus because they bring a cart to your table to show you the menu...steak and seafood...the only things on the menu. Our steak was cooked to perfection (medium rare +)...crab legs were also delicious. The service was right on time and great. A really nice spot. My family has been dining at La Cave since the 1960's. La Cave never disappoints. The twice baked potato was not very good. It seemed like it was made the day before. The shrimp and steak was excellent. The twice baked potato was not worth ordering. Great Food and drinks! Love the waitress, treated us like locals. Always great service from the time one enters. This night was very busy and some of the other patrons got fairly loud. The food was excellent, the staff attentive. La Cave is a special, unique spot. My wife and I had our first date there some 15 years ago. We return for anniversaries and special occasions - and often for happy hour, which is a great value. La Cave is one of a kind and always memorable. Great service; so so food. Amazing food and even better dessert! We tried to Carrot Cake and it was to die for! Server was very helpful and attentive! Enjoyed last time, but I will try to avoid eating here on busy nights. Service was unorganized, except the water guy who was filling your glass every 10 minutes, and the food was average. Halibut was overcooked and dry, twice baked potato not sure how long ago it was made. Still like the place for it's history. I had the halibut and twice baked potato, side of asparagus. Halibut was over cooked and pretty dry, pretty tasteless. I had to put lemon on it to soften it up. Nice intimate ambiance with good food and service. Elvis singer was pretty good. Patty is the best waitress. Very polite and accommodating. Great restaurant. Food was excellent, service was great really nice evening! Food and service was outstanding especially considering it was a huge Valentines Day crowd. Did not live up to the hype. The steaks and prime rib were not hot...barely warm. The food was average for a very expensive dinner. Wonderful ambiance, service and excellent food. Everything about La Cave is wonderful except its a little pricy with no prices on the menu. La Cave has been in business since the 60"s and food is good and the staff very attentive. Service was excellent. Food was excellent. Bands were very good. People were very nice. Bartenders even nicer. Couldn't have had a better time elsewhere. 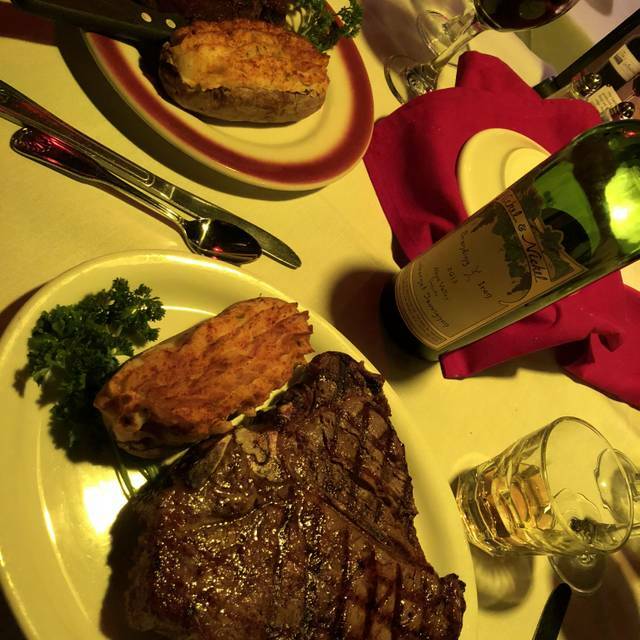 The food quality and portion rivals larger, more well-known steakhouses! Excellent overall experience!! Love that nothing has changed. It is a staple restaurant. Would I invite a friend to La Cave? Would depend on the occasion, having your anniversary there Is not at all the best exsperiance due to the loud conversations that serounded my wife and I. We could barely hear ourselves. My first experience was that it was more of a high end social bar. Great meal and good service. Our service people left us alone and we enjoyed ourselves. Given this was our umpteenth visit to La Cave, you can guess it is our "go-to" when we want a special evening out. Our food was perfectly prepared, the service was outstanding and even though it was Saturday night we were able to secure a reservation and were seated with no delay. The only problem encountered was, well, "three strikes". First, why doesn't a classic steakhouse like La Cave have a single drop of dry sherry at the bar? Second, what do you mean no Bearnaise sauce for my filet? And third, okay I was able to order Courvoisier, but not Remy Martin. What gives? Otherwise, yes, an outstanding experience, and we continually recommend La Cave to other! I have always LOVED La Cave. The atmosphere is second to none. BUT this experience was not as wonderful. The clam chowder and twice baked potatoes were so spicy. We concluded the white pepper was used in excess. The steak was amazing, which is why it got the review it did. I hope this was just a one time mistake by the cooks. Otherwise, great for special occasions.